At 4:30 p.m., the Kenneth P. LaValle Stadium parking lot was filled with people tailgating. By 7 p.m. game-time, the bleachers had thousands of Seawolves fans. After the game, young athletes — high school and youth-league players — waited in queue for autographs from their favorite college athletes. This was no college football game, but rather the hub of college women’s lacrosse. 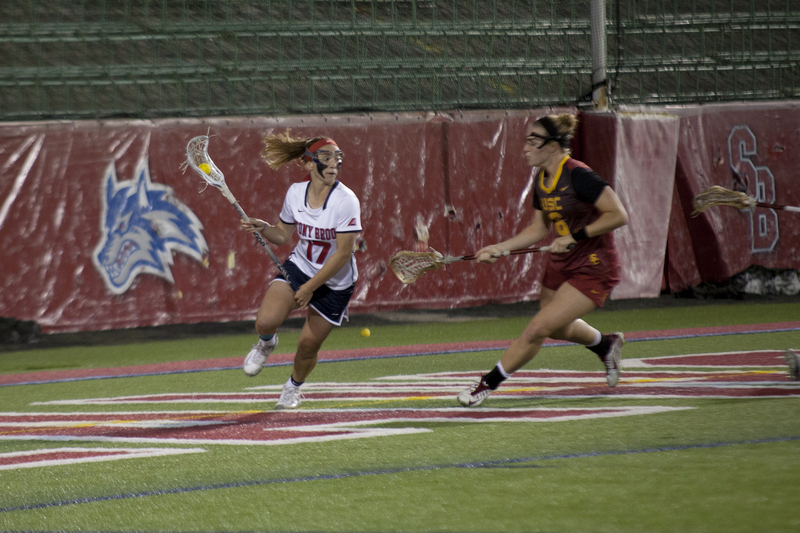 In front of the second-largest crowd in program history, the Seawolves held off the University of Southern California Trojans, 9-7, in a battle of the top-10 teams in the country. Junior attacker Kylie Ohlmiller, who scored three goals and two assists, noted that little girls were screaming her name from the concourse when she proceeded to greet them after the victory. “The fans on Long Island are insane,” she said. The No. 7 Seawolves started the game with a flurry of goals — taking a 5-1 lead as the No. 9 Trojans used a “face-guard” on Ohlmiller — but the road team clawed its way back into it. At halftime the deficit was 8-5, then with 5:02 to play, the score was trimmed to 9-7 and USC won the draw to take possession. With the contest on the line, the Seawolves were able to end the Trojans run. USC had two shots on goal that could have cut the lead to one, but sophomore goalkeeper Anna Tesoriero stopped both, her eighth and ninth saves of the game, to secure the win. In typical Spallina style, the coach chirped Tesoriero throughout the practice week about the opposing goalkeeper, USC junior and Team USA starter Gussie Johns, and how she was the best netminder in the country. With that as motivation, Tesoriero out-saved Jones nine to four. “I think she was the difference in the game,” Spallina said. Senior midfielder Kristin Yevoli had four ground balls, three caused turnovers and four draw controls in the win. The faceoff circle was a particular focus for the team against USC senior midfielder Michaela Michael, the NCAA active leader in draw controls. The game’s official attendance was 2,516, a number that could be repeated next weekend. After heading to New Hampshire for Sunday’s America East Conference opener, Stony Brook will have two home games next weekend against No. 6 Colorado on Friday night and rival Albany on Sunday afternoon. Spallina is satisfied with how his team has progressed to this point in the season, even without senior attacker Courtney Murphy, out for the season with a torn ACL.